Is meta description still relevant? Meta descriptions are used by Google probably 80% of the time for the snippet. They don’t help with rankings but you should probably use them. You could just auto generate them from the first part of the question. To be honest I think this recommendation comes from stalwarts in the SEO community who just can't move past the fact that their knowledge of how search worked back in 1999 isn't how it works in 2011. It use to be that the description tag was used as the blurb below the title, because no real analytics was really done on a page. Everything you searched for was based on the keyword or the description meta tags. I would say that it is not worth the extra bytes to add it to your page. Because the search engines you really care about, Google and Bing, already find the relevant information in the page. And if they don't the search probably isn't going to show up anyways. This is a protocol much like the meta keywords and descriptions used by search engines of the past. But unlike the deprecated use of the meta keywords and description tags, this meta protocol is actively in use by Facebook. Since Facebook is a highly structuralized environment it makes sense to control your information that is sent to them using meta data. Lets start with an example, and walk through how we would update it using the Open Graph Protocol (OGP). Since this is the page that started this post, it seems fitting that it is the page I should use to demonstrate the OGP. Lets take a look at what the meta data looks like for this page. Note: I have removed tags that are not relevant to this discussion. Lets first take a look at what the Facebook Lint tools can pick up from the information already provided in these Meta tags. The Facebook Lint tool shows what information it can extract out of your page, for when it posts the information to your users Facebook wall when they click for example the Like button. To view this same information as of writing this post you can visit the Facebook Lint tool too. The first thing we should be concerned about is that the site name, in this case “Pro Webmasters – Stack Exchange” isn’t broken out from the title of the article. By breaking out the site name it allows Facebook to create a unique link between Facebook users and your site, so that when something else interesting coming from your site shows up in their graph of friends they will get alerted to it on their news feed. So this is very important for the organic growth of your site in the Facebook community. The second thing we should be concerned about is that the image Facebook automatically choose to associate with this post is broken. Which I am sure is just an oversight on the Stack Exchange team since it comes from their CDN server. But what is more concerning is that you are letting the users of the site control the images that are associated with your sites name. So even though this isn’t that concerning, it is a level of control that Facebook affords to you. If you choose not to exercise it they just choose the first image they find on the site. The third thing is that while in this case it turned out the description was relatively accurate as a description of the post. It might not always be the case, and most of the time you can generate a better description than Facebook can by choosing from the description meta tag or the first paragraph tag on your site. So this is just another level of control that Facebook affords you to make so that the message that is communicated through Facebook is as accurate as possible. Given the three problems I described with the StackExchange meta tagging relating to the OGP, I would add the following to their page header. I broke the implementation in to two specific sections. However if this meta data wasn’t provided and the original non-OGP implementation of the StackExchange question was used. The News Feed post would read “Fransis Luu likes Is meta description still relevant? - Pro Webmasters - Stack Exchange” instead of the much more stylized “Fransis Luu likes Is meta description still relevant? 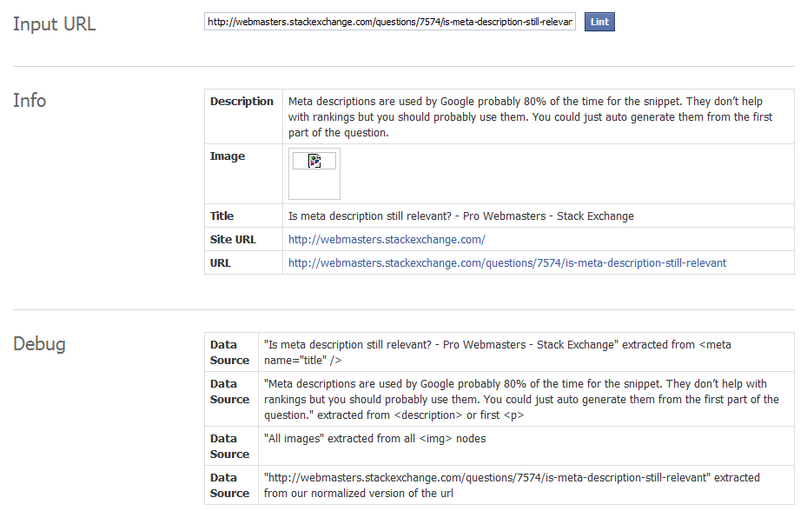 on Pro Webmasters – Stack Exchange” with all the proper linking. This is information that will most likely stay the same across all pages in your site regardless of the type or content. og:site_name: this should be your site name. It provides a human readable name that helps identify your site to Facebook users. fb:app_id: this allows you to use Facebook Insight (the Google Analytics of Facebook) to monitor the traffic coming from and going to your site. As well as provide a unique identifier so that the site can be used in the graph when alerting friends of friends about the joint interests in the same site. This is information that will most likely be unique to just the page. og:title: The title of the content being displayed in the page. og:type: The type of information being displayed on this page. This can be used to describe real-life objects such as people, places and things. But in this case since the page doesn’t talk about real-life things, it should just be labeled as article. og:image: The image you want associated with the link to the article. If this is not provided a seemingly random image is chosen from the page. og:url: The is the canonical URL that you want associated with the page. This serves the same purpose as <link rel=”canonical” /> meta tag, but it is probably important that it is set in addition to any other meta information in your header. og:description: The content blub of one or two sentences that you want posted in the News Feed along with your link, to provide more content on the link. As a test I clicked a couple of the like buttons on my website, so that you could see why implementing the OGP is important. I took a picture from two different perspectives. My news feed, and my profile feed. As you can see both of my likes statements were grouped together and property attributed to my blog "Nick Berardi's Coder Journal". So Facebook is able to use the meta information that we provide to create nice and fluent statements for the friends in the graph to see. It also creates a nice compact statement that doesn't create a lot of redundant information for friends who may be interested in what I like. On the profile page it is a different story, because on the profile page it is more important to communicate each individual like statement instead of saving space. So each one is attributed individually in the order which I said I liked them. As you can see while the importants of the description and keywords meta data has decreased as search engines became smarter at interpreting what you were looking for. All meta data hasn’t seen the same fate, and new medians like Facebook need this meta data to provide accurate information about your content, in addition to allowing you control over how that information gets seen by users in their system.